The cleaning device manufacturer and drinking water specialist Kärcher is bringing a completely new range of water dispensers onto the market. The WPD 100, 200 and 600 models can cater for between five and 200 people. Through the use of a modular design, the devices can be individually configured. A fixed mains water connection not only provides a constant supply of fresh water but also makes the water dispenser particularly eco-friendly and economical in terms of operation and maintenance, compared with bottles and gallon containers. Where a particularly high water quality is required, in hospitals or retirement homes for example, the new WPD machine can be equipped with a multi-stage filter system and an automatic disinfection function. The dispensers’ hygiene concept is completed by protection against direct contact with the water outlet, combined with smooth, easy-to-clean surfaces. 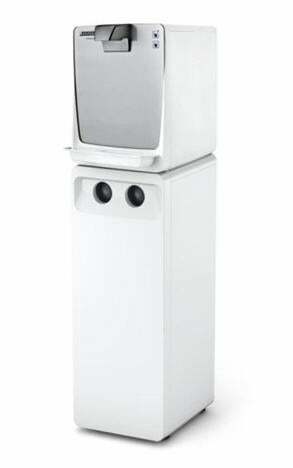 For supermarkets or in places frequented by the public, for example, there is a water dispenser with just the two standard variants, chilled and unchilled. Hotels can choose a desktop version for their buffets. The front panels can be personalised so that the water dispenser reflects a company’s corporate identity or the interior design of a showroom. As a special visual feature, an LED lighting panel in the dispensing area complements its attractive external design. For large companies and factory buildings, fleet management is a worthwhile option, which, using an optional network connection, allows the WPD device to communicate with a computer or smartphone so that the operator can remotely monitor the need, for example, to change a filter or a CO2 cylinder or to de-scale a machine. The new WPD dispensers can produce pure water hygienically in any form; room temperature or chilled (sparkling or still), and hot water. Models are available with the option for the user to choose how carbonated the water should be or how hot. By pressing the right buttons the user can also specify the quantity of water to be dispensed: 0.2l for a glass and 0.5l or 1l for bottles, which fit beneath the 30cm high dispensing point with ease.